Image courtesy of the Trinity Police Department - Facebook. Police officers across the United States have taken a hit this week as radical groups continue to target them with rhetoric and physical and emotional attacks. As part of a way to provide moral support, this week is Blue Wave Shore to Shore Police Appreciation Week, for those who would like to participate and let our officers know there are many of us who care. 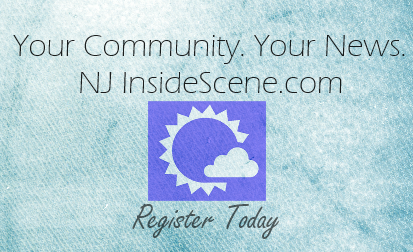 Click here to learn more about this event and participate in your community. This particular event takes place through July 25, though we should remember to honor our police officers every day of the year, even if it’s just a simple “thank you” for all they do. Our police officers are on call night and day, 24/7, all the year through. Our officers throughout the nation come from all walks of life, in all skin tones, and are of all religious affiliations. Having gotten to know many police officers over my lifetime on a professional and personal level, including some who are family and some who are very dear friends, I will say that the propaganda that has been circulating wrongly generalizes an entire group of over a million individuals employed in the law enforcement profession for the actions of a few, and sadly our highest leaders of this land support that false narrative. Being a police officer isn’t just about giving tickets and catching “the bad guy.” These fine individuals come to serve our communities and see a lot of things on a daily basis I know they wish they could unsee. Imagine having to see something horrific or tragic on a daily basis and still needing to remain stoic as you witness it? Most of us civilians just couldn’t and wouldn’t do it. For me, since “creative” is an operative word in this appreciation week challenge…officers everywhere around the nation and around the world (because I know from an officer friend in Europe this hate has spread beyond our country’s shores), I dedicate this post and sharing the word about it to you. I take “creative” literally as a writer. I say “thank you” for your service. And while a bottle of water is great, this post is something that will be lasting long after the empty water bottle has been recycled, and will be online always. I hope long after this appreciation week is finished, it will raise enough awareness that people will continue to find it, read and make each day an appreciation day. 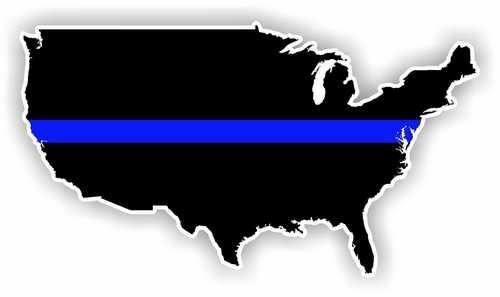 The “thin blue line,” a symbol of mourning for police departments, across the United States. Image courtesy of Facebook. For those of you who are first-time readers to my publication, while I write about a range of topics, if you’re an officer of the law, know you are always welcome here. Inside Scene is not the type of publication that reflects the view of most of the mainstream propaganda. We are very pro-American, pro-U.S. military, pro-veterans and law enforcement friendly. Why? Not just because I’m a reporter who doesn’t sensationalize and instead wants to disseminate the facts and truth. I also don’t like spreading false narratives and propaganda. I work with police departments a lot in my vocation and I see and appreciate what they do for our communities. I’m not saying there aren’t bad folks running around who wear a badge…every profession has a few bad apples, including civilian jobs. But for the most part, the police officers out there and the ones I’ve encountered through the work I do, both in “real life” and online, are very caring, appreciative and polite people (and by the way, still use “sir” and “ma’am” unlike many today who barely say “please,” “thank you” or “you’re welcome”). They take their work and service to the community very seriously and sincerely. They join the departments to serve their communities. And I like to honor the great things that our officers and our law enforcement do each day rather than supporting the false narratives. I have memories throughout my lifetime on a personal level too, where police officers have come to my aid, such as the rainy night that my car was rammed at a stoplight by an inattentive driver. It was my son’s birthday unfortunately, and we spent part of the evening at the emergency room. The first on the scene was a police officer of Jefferson Township, New Jersey who was kind and walked me through the entire process of what was next, as I’d never even thankfully traveled in an ambulance before. The officer took my car as well and parked it for me in a safe location nearby the accident site. He helped to keep me calm throughout the entire incident. I promise anyone reading this, law enforcement friendly or not, if there is a case of a police officer legitimately behaving badly and I’m slated to write about it…I will. And I know that officers will understand and be in support. Just because one’s blood runs blue does not mean that officers condone those rare instances of bad behavior…in fact, I’ve seen many officers be very critical and outspoken on social media of other police officers in that very small segment who aren’t operating in their careers with integrity. Sadly, the mainstream media doesn’t typically do the same and the false narratives prevail. I will say those bogus stories won’t air on my channel. I’ve already written two that mainstream media ignores because it conflicts with the advertising support that they receive, as well as the views of their main reader bases in the cases of Philando Castile. Both of these stories have gained traction from truth-seekers…the first, about Diamond Reynolds smoking pot (click here) and the second about Philando Castile’s gun pictured on his lap, an image a reader pointed out to me after I wrote about the pot smoking incident (click here). Officer Jeronimo Yanez had every right to stop Philando Castile because he looked like the suspect in an armed robbery. The photos prove that (see my second article). When he did, Castile had a gun in his lap. The image from Reynolds’ video proves that too. Castile didn’t listen to Yanez’s directives to put his hands where they could be seen. He had a gun on his lap. These are two things, which initiated the shooting. Anyone with half an ounce of common sense could see that. Castile would still be alive today if he had only listened. And I can assure you Castile’s death has traumatized this police officer. He was distraught after having discharged his weapon and witnessing the outcome, though he was in the right for doing so. This pain will stay with Officer Yanez for his entire life, even though he was doing his job. The thugs, however, who continue to target our officers, are smug and satisfied over the murders they commit. No one should be encouraging this kind of behavior and those who do are truly in as much need of a reality check as those who commit these horrific acts. To our officers: there are so many of us in a majority, who “get it” and like you, are being tromped on and silenced by a smaller but louder faction. Those of us who have a voice will continue to use it and speak up for you in cases such as the above. To everyone reading, I encourage you to take up the challenge and embrace our hardworking police officers across the nation today. Please quit generalizing. Please quit supporting websites and social media sites that defame police officers. They need us all the time, but even more than ever now. Remember, it’s these officers who watch our communities night and day to keep us safe. It’s their families who have also made the sacrifice. I remember weekends and even holidays where one of my loved ones in law enforcement wasn’t with us, even one Christmas Eve not returning home because of having to investigate a murder. Crime doesn’t stop…so our police departments cannot stop either. Whether you drop off a bottle of water or dinner this week to a police officer or his or her department, or even give a simple word of “thanks” I promise you, it will be appreciated. Kindness costs nothing but a few minutes of your time. For everyone in law enforcement…thank you again and thank you to your families…God bless and my prayers of safety to all of you always. Like what you read here? Then stay on the scene with Inside Scene…click here to “like” InsideScene.com on Facebook.